Bocce (/boʊtʃi/), sometimes anglicized as bocci or boccie, is a ball sport belonging to the boules family, closely related to British bowls and French pétanque, with a common ancestry from ancient games played in the Roman Empire. Developed into its present form in Italy (where it is called bocce, the plural of the Italian word boccia which means 'bowl' in the sport sense), it is played around Europe and also in overseas areas that have received Italian migrants, including Australia, North America, and South America (where it is known as bochas, or bolas criollas ('Criollo balls') in Venezuela, bocha in Brazil). Bocce was initially played among the Italian migrants but has slowly become more popular with their descendants and the wider community. Bocce is traditionally played on natural soil and asphalt courts 27.5 metres (90 ft) in length and 2.5 to 4 metres (8.2 to 13.1 ft) wide. Bocce balls can be made of metal or various kinds of plastic. Unlike lawn bowls, bocce balls are spherical and have no inbuilt bias. A game can be conducted between two players, or two teams of two, three, or four. A match is started by a randomly chosen side being given the opportunity to throw a smaller ball, the jack (called a boccino ('little bocce') or pallino ('bullet' or 'little ball') in Italian, depending on local custom), from one end of the court into a zone 5 metres (16 ft) in length, ending 2.5 metres (8.2 ft) from the far end of the court. If the first team misses twice, the other team is awarded the opportunity to place the jack anywhere they choose within the prescribed zone. Players are permitted to throw the ball in the air using an underarm action. This is generally used to knock either the jack or another ball away to attain a more favorable position. Tactics can get quite complex when players have sufficient control over the ball to throw or roll it accurately. A variation called bocce volo uses a metal ball, which is thrown overhand (palm down), after a run-up to the throwing line. In that latter respect, it is similar to the French boules game jeu provençal also known as boule lyonnaise. A French variant of the game is called pétanque, and (lacking the run-up) is more similar in some respects to traditional bocce. Another development, for persons with disabilities, is called boccia. It is a shorter-range game, played with leather balls on an indoor, smooth surface. 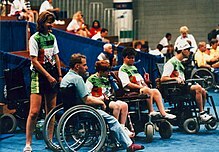 Boccia was first introduced to the Paralympics at the 1984 New York/Stoke Mandeville Games, and is one of the only two Paralympic sports that do not have an Olympic counterpart (the other being goalball). ^ "modernruins.com". Archived from the original on 2007-10-18. Retrieved 2008-01-04. ^ "boccia". Italian-English translation in the CollinsDictionary.com. Collins English Dictionary - Complete & Unabridged 11th Edition. Retrieved 8 November 2012. ^ "Bocce Association of Slovenia". Archived from the original on 2010-06-11. Retrieved 2010-06-16. ^ "Slovene Ethnographic Museum". Archived from the original on 2013-06-22. Retrieved 2012-03-13. ^ "Boccia". International Paralympic Committee. Retrieved 2018-03-12. Wikimedia Commons has media related to Bocce.